Just to update everyone that unbelievably I have now raised £1512!!! FANTASTIC! Thank you so much to everyone who has donated. It's very difficult to express how much your support means to Helen and I. We really have been blown away by everyone's generosity. When I set a target of £1000 I knew that it was ambitious. There were times when I thought I may not get there. I never for one minute expected to raise half that amount again! I've been contacted by Ruth from the Miscarriage Association, who is going to put an article about the walk in the Associations newsletter. If I can I will include it in the blog or put a link in so watch this space. The last day. I'd been walking every day for two weeks. So far I'd got two blisters (one on each little toe) and after about the first five miles each day my left knee ached and my left ankle was giving me jip! But I was really excited about finishing my 200 mile odyssey today. 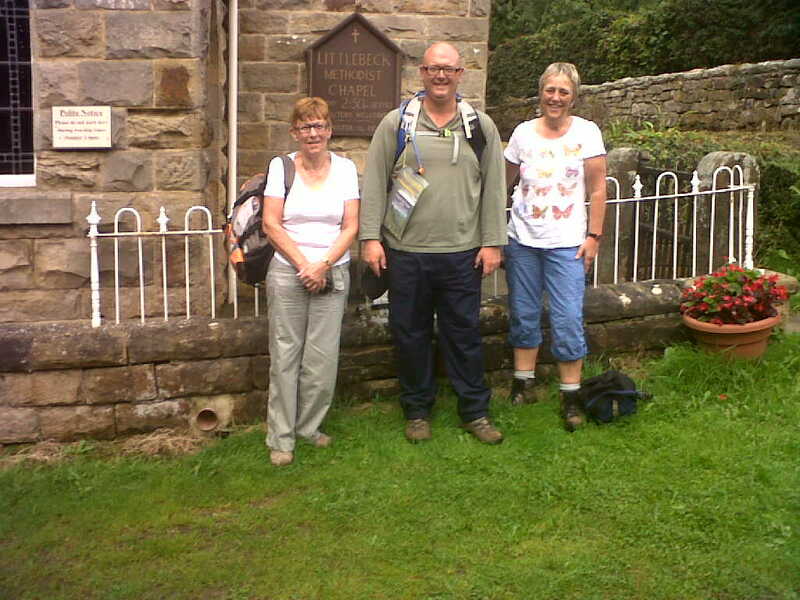 We started where I had finished yesterday, outside the Methodist Chapel in Littlebeck. I was joined by my Mum, who attends a walking group in Cotgrave, and our friend Charlotte. The weather was a mix of cloud and sunny spells, and some light showers were forecast in the afternoon (they never came). The path through Littlebeck woods was muddier than I had anticipated but Mum and Charlotte soldiered on through, and insisted it was fine (however, the mud was nothing compared to the bogs and soggy peat hags on the way from Nine Standards to Ravenseat). 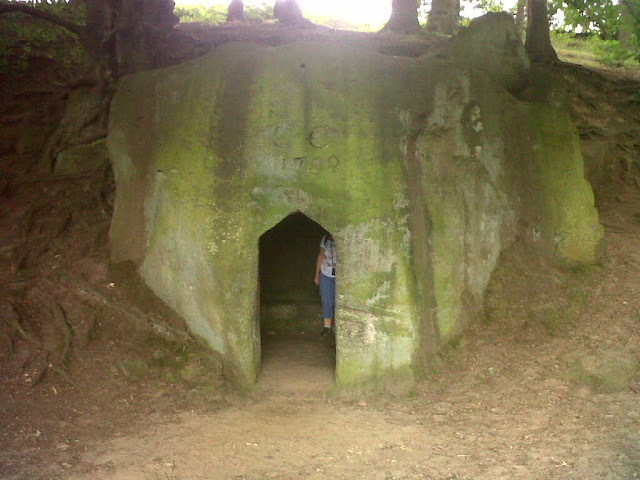 We eventually came across the Hermitage, a picture of which is below. www.eskvalley.com says that "It is in fact a folly and was carved out of the rock about 1760 by an out of work seaman on the instructions of the local schoolmaster. 2 wishing chairs were placed on the top of the Hermitage, it is said that if you made a wish in one, you must then sit in the other one to make it come true." We got to the Falling Foss waterfall and Midge Hall tearooms shortly afterwards, but we were so early that the tearoom was not open yet. 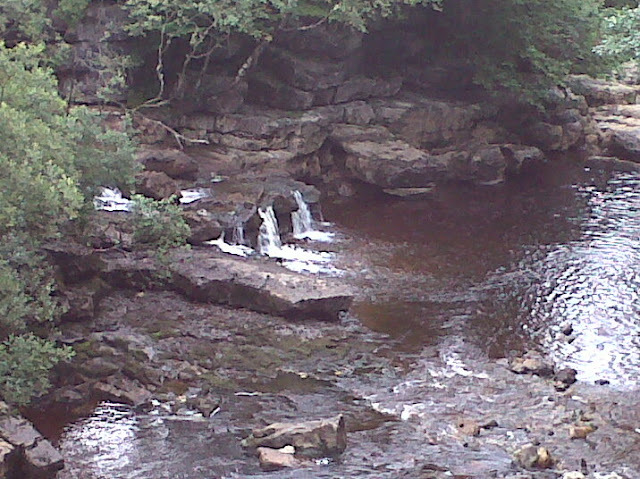 We decided to press on after a brief stop to admire the falls and the beck. Just beyond the tearooms we crossed the river on stepping stones and carried on through the forest to the car park at the end of the forest. 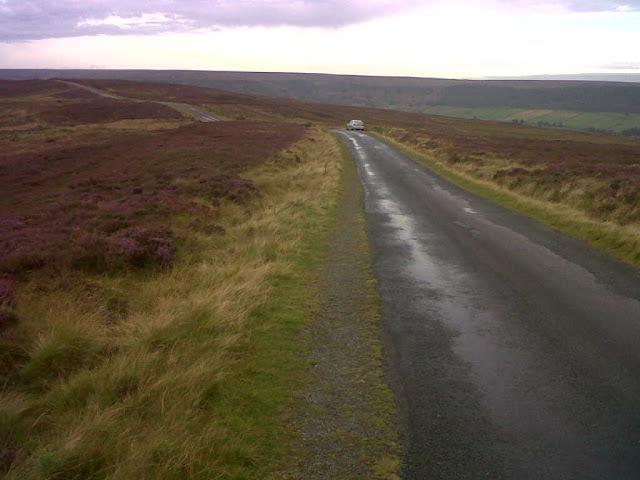 After leaving the beautiful woods near Littlebeck, we started to cross the moors on our way to Hawsker and the coast. The sun was shining and the going was good, but soon the moorland became boggier and boggier. There were patches of moorland where the three of us had to negotiate some fairly deep bogs which on occasion rivalled those found on the moorland near Ravenseat in the Yorkshire Dales. I was surprised at how boggy this part of the walk was as the guide book did not mention it as an issue here, and we had only had one bout of rain the the last fortnight. 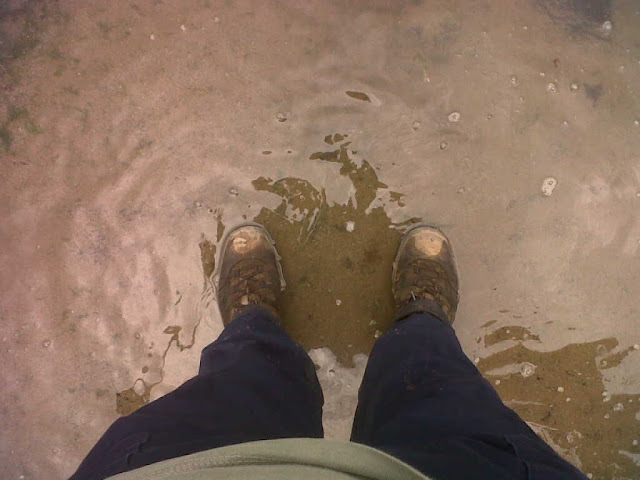 We all got wet feet and trousers but continued on our journey. After one last session of back tracking, jumping and tiptoeing over some very wet ground, we found the track which would lead us up to Low and High Hawsker. 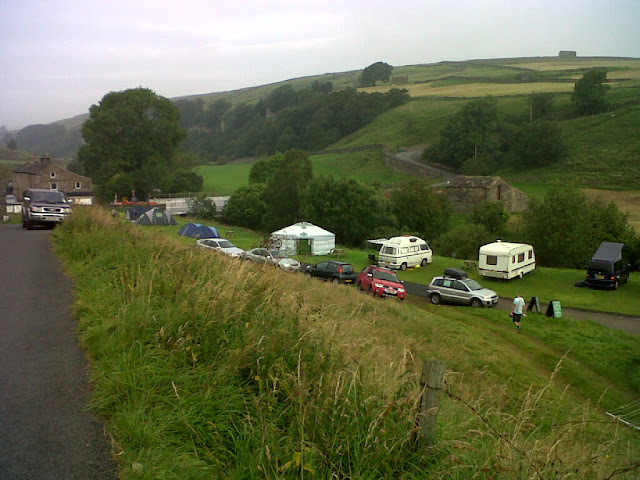 The road walking was both a refreshing change but also hard on the feet, and I was glad when we reached the tearooms at the caravan site where we all stopped for tea and a butty. Feeling suitably refueled and refreshed, we wound our way through the static caravans and found the path along the cliffs which would take up to Robin Hoods Bay. I experienced a mixture of feelings as we enjoyed the sea views. I was excited and keen to see my family, having been away from them for two weeks, and I was also feeling wistful as for all of the trials and tribulations endured along the way, I had enjoyed the walk immensely and would miss getting up every day and walking an average of 14 miles! The walk along the cliffs lasted ages and the landscape conspired to keep the sight of Robin Hoods Bay from me right until the last minute. When I first saw the picturesque jumble of houses and seaside cottages peeking around the headland I was ecstatic! I instantly sped up, my pace increasing with my excitement as I marched past the first houses by the footpath. The track became a path and the path became a road, and I had to watch my step going down that steep hill in case my over-excitement resulted in an accident! I finally made it down to the bay to be met by family and friends who had all come up to spend a day or two with us to celebrate my achievement. It was an emotional moment as I saw my boy and my wife for the first time in two weeks, knowing what I had achieved and knowing how much money we had raised. After photos and hellos, Helen, Lachlan and I walked down to the sea on our own, and tossed our pebbles into the North Sea. I had bought five pebbles with me in my rucksack, all the way from St Bees beach. One for me, one for Helen, one for Lachlan, and one for each of the babies we lost. I signed the book in the Bay Hotel, got my certificate, and was enjoying a pint when Helen went outside onto the balcony with Lachlan and called me outside. 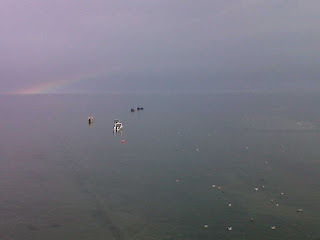 A rainbow had appeared over the sea, just opposite the bay. The ukulele song that night, and fitting end to this adventure was 'Somewhere Over the Rainbow'. It was 9am on Saturday 18th August when I started walking. The weather was cloudy and temperate crisp as I started this penultimate leg of the walk from Glaisdale Rigg to Littlebeck. Having done the extra few miles yesterday, it meant I only had 14.5 miles to do today, and only 12 on the last day. 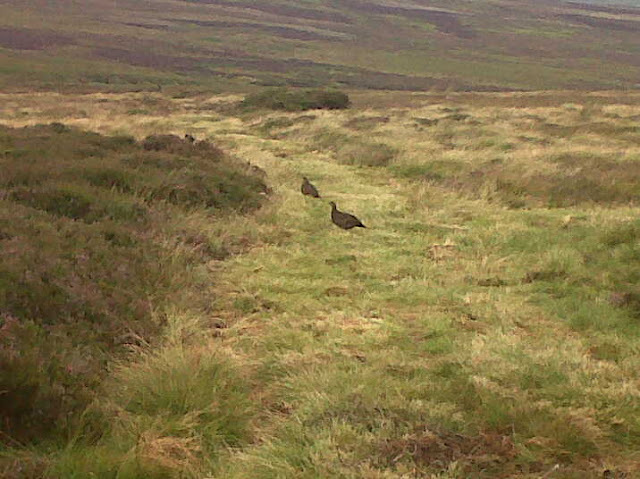 the moors were empty apart from me and the grouse as I stomped down the road towards Glaisdale. 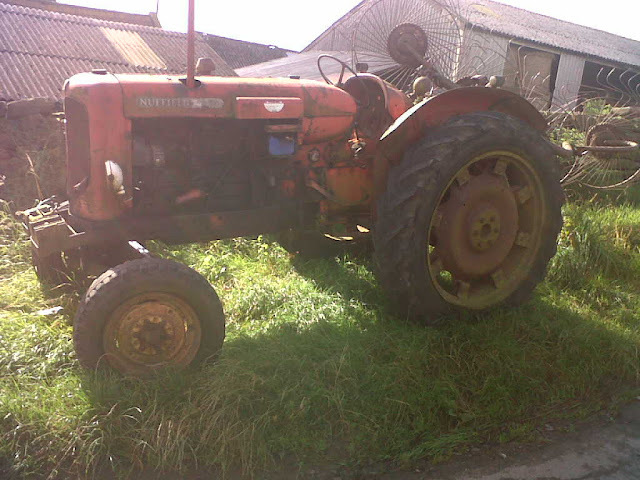 On the way down off the Rigg I spotted a lovely old tractor outside a farm near Glaisdale and just had to take a picture as Helen absolutely LOVES old tractors. The walk through Glaisdale took me down some steep roads and footpaths which led to Beggars Bridge. Wikipedia says that Beggar's Bridge was built by Thomas Ferris in 1619. Ferris was a poor man who hoped to wed the daughter of a wealthy local squire. In order to win her hand, he planned to set sail from Whitby to make his fortune. 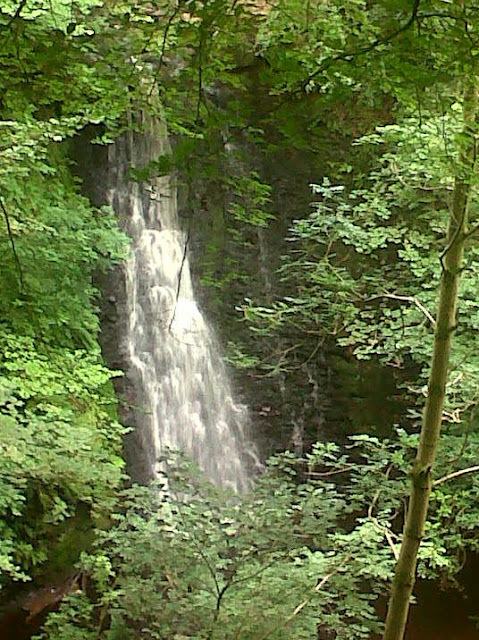 On the night that he left, the Esk was swollen with rainfall and he was unable to make a last visit to his intended. 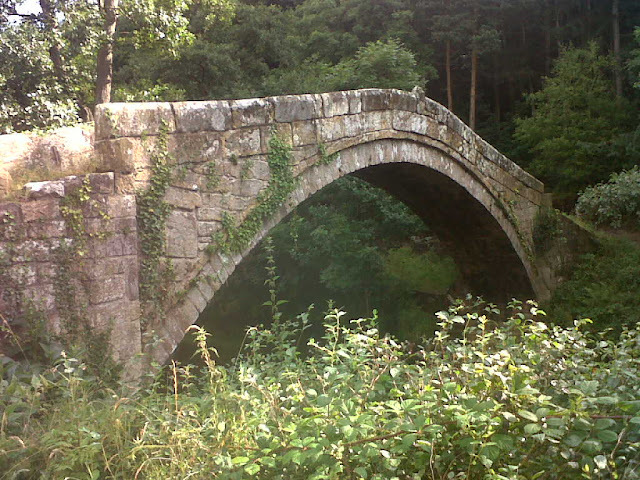 He eventually returned from his travels a rich man and, after marrying the squire's daughter, built Beggar's Bridge so that no other lovers would be separated as they were. Following this romantic river crossing, I entered East Arncliffe Wood and followed a very pretty stone slab path through the woodland. The morning light dappled through the canopy as I enjoyed the shade afforded by this scenic and atmospheric woodland. It was in the wood that I met up with a trio of walkers from Manchester who were completing the Coast to Coast in 10 days! 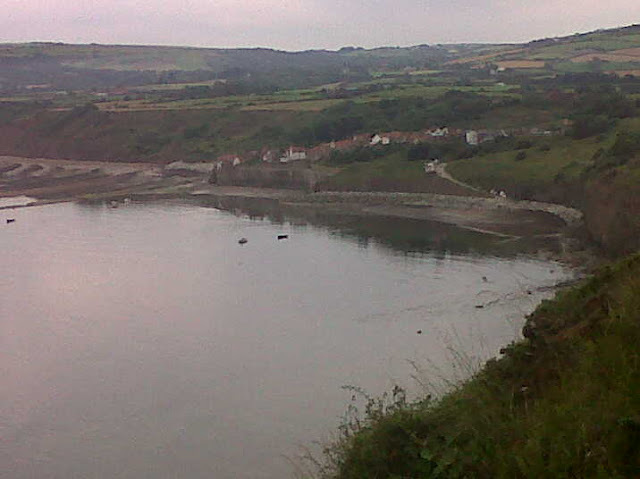 They were walking all the way to Robin Hoods Bay today, and were keeping quite a quick pace. 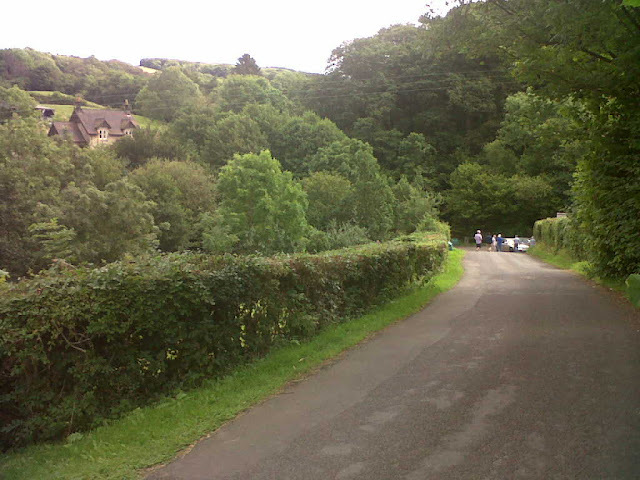 I walked with them through Egton Bridge and halfway to Grosmont, at which point I had to slow my own pace down, and parted company with these generous and chatty people. 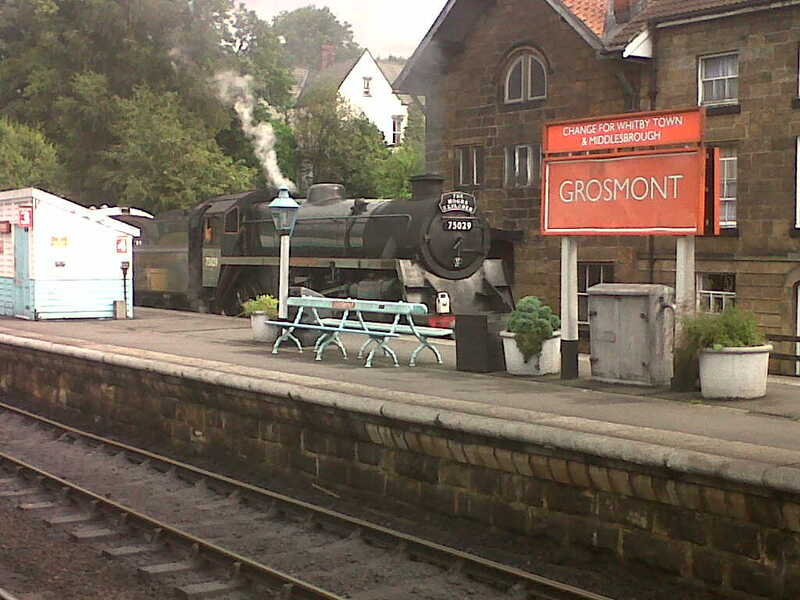 Getting my breath back, I strolled into Grosmont to find my Dad sitting on a bench watching the trains go by. Hot and bothered I decided to have a stop and drink and join him. 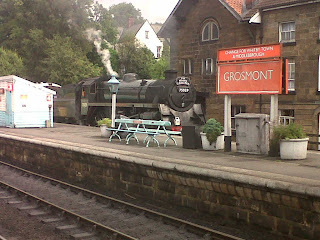 The trains were great and after a welcome break I began my slog up the big hill outside Grosmont. Now I knew that this 1:3 gradient was going to be tough, but nothing prepared me for how long it was going to take me to get to the top. It felt like it went on for ages! My first view of the North Sea! Woohoo! 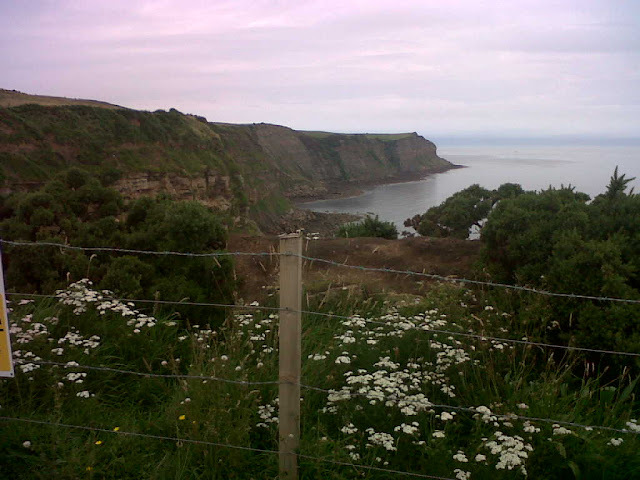 However, when I did get to the top, I was granted my first proper view of the North Sea, my ultimate destination. 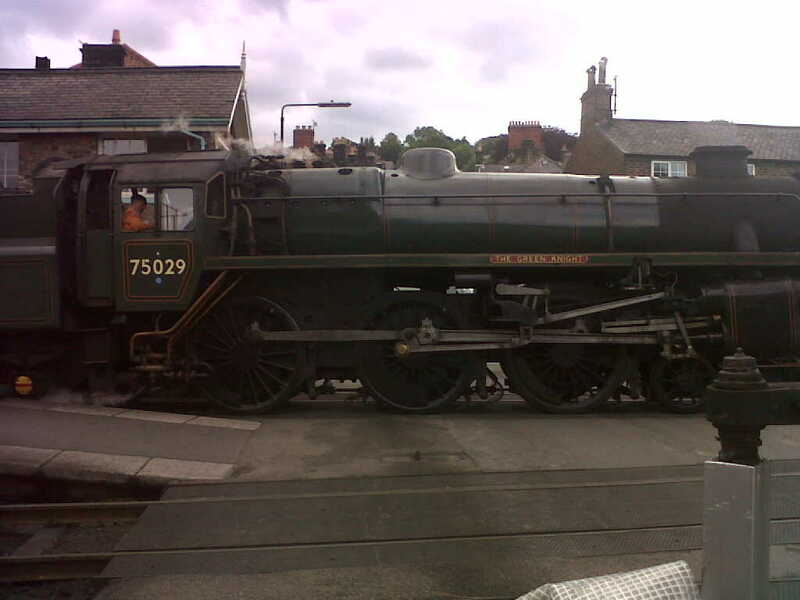 Yes, that's 1 in 3 and it went on for absolutely ages just outside Grosmont! 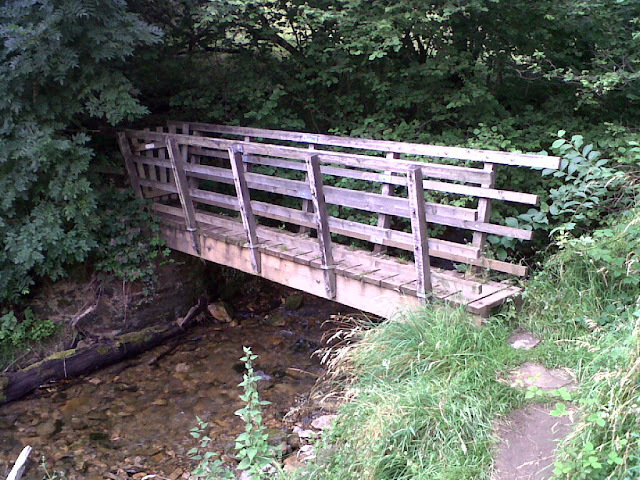 I finally made it into Littlebeck at 2.45pm, having walked 14.5 miles. I made good time and was ready for my last day. Ukulele song played tonight was Waterloo Sunset. Day 12. A Day of Two Halves! Started walking at 8am this morning. Decided to extend today to make tomorrow shorter. 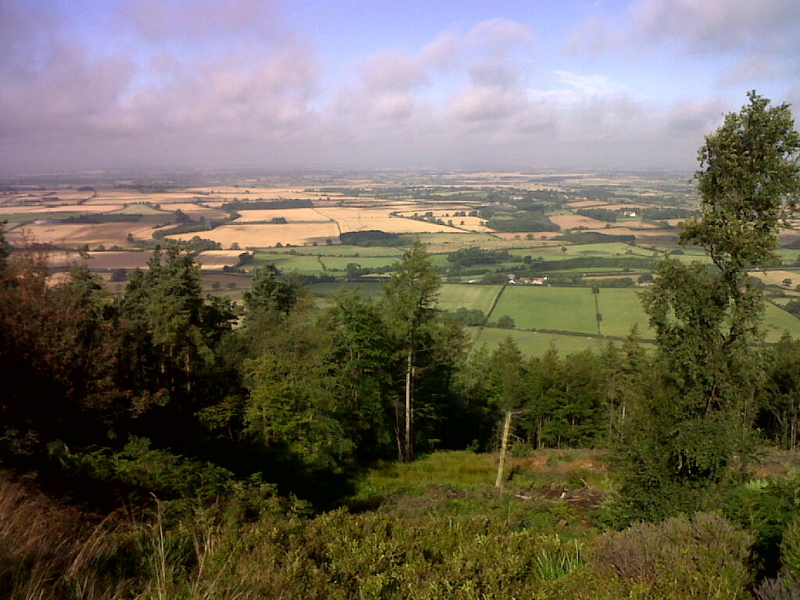 Walked up steep climb first thing up onto Clay Bank Top. Grey clouds were gathering as I walked east. The track was clear, level and wide and it was fast walking. Good job as at about 9.30 the clouds rolled in and stayed with me all morning. The wind picked up and was blowing fast and the rain was horizontal. 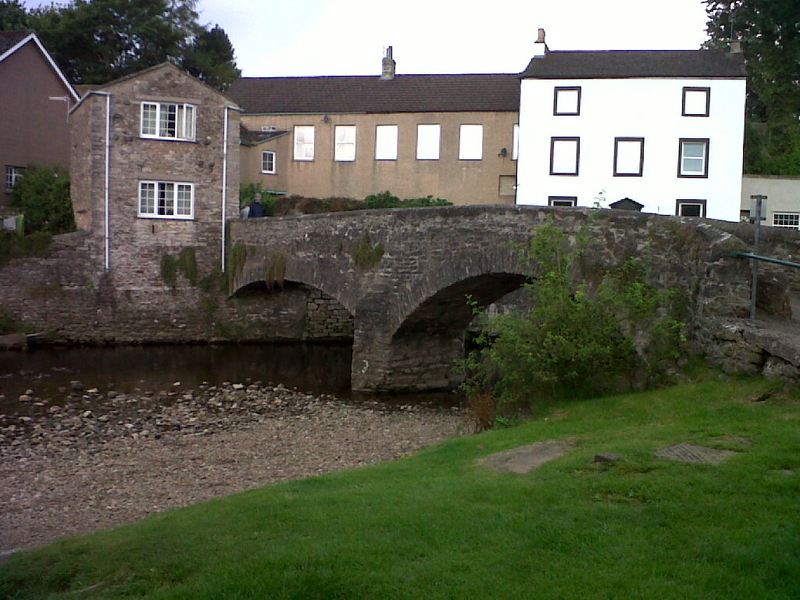 I walked fast to get to the Lion Inn, 9 miles away. I got soaked to the skin, even the inside of my boots were wet! The cloud was down and I could not navigate except to follow the path. I squelched into the Lion inn car park at 11.30 to find Dad in his car and we went inside to regroup. We both agreed that it would be almost impossible to camp at the Lion Inn in those conditions so we agreed to find a B&B to stay in. We struggled for a while as it's Friday, but eventually found one. After changing clothes I set off again at 1.30pm to finish the last few miles which I did at 3.45pm, hence a day of two halves! 14 miles walked in total today. 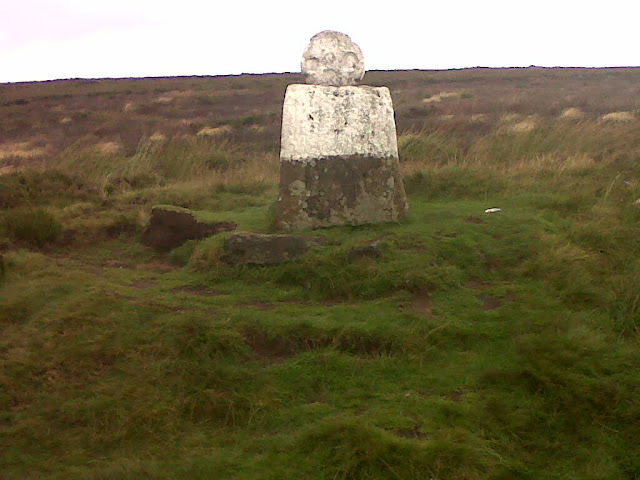 According to the interweb "Fat Betty ( sometimes referred to as White Cross ) stands just north of, and is easily accessible from the road that leads from Blakey Rigg to Rosedale Abbey, at the junction of the Danby, Westerdale and Rosedale parishes. The head of the cross is an ancient wheelhead painted white, set into a large stone base. 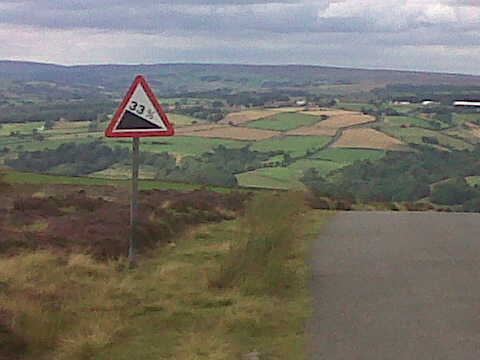 It could possibly be Norman and is only one of two known wheelheads on the North York Moors. It perhaps takes its name from a cistercian nun, Sister Elizabeth from the Priory at Rosedale These nuns wore gowns of undyed wool and were referred to as ' White Ladies'. Another tale is that a local farmer's wife, Fat Betty, fell from their horse and cart on a dark, foggy night. When he arrived home and noticed she was missing from the back of the cart he retraced his route across the moor and all he could find was the large, squat stone". I wonder?! 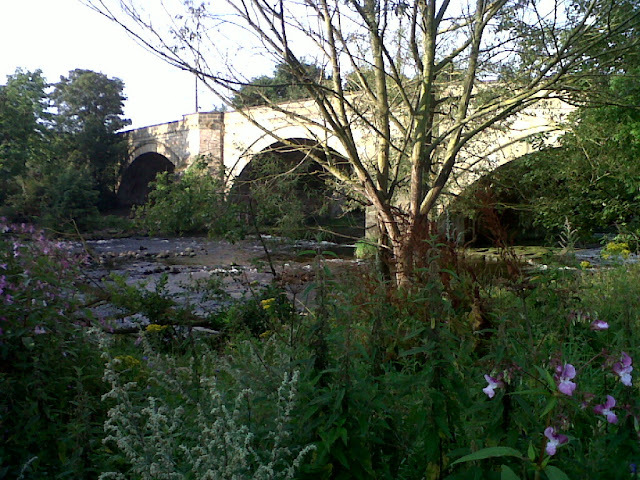 Gary's hoping that the weather will be a bit better tomorrow - for his 14.5 mile walk to Littlebeck. Ukulele song of the day is appropriately enough, "Button Up Your Overcoat"
Started walking today at 8.30am, Day started well as I bumped into fellow walker Stuart as I set off from the Blue Bell Inn in Ingleby Cross. 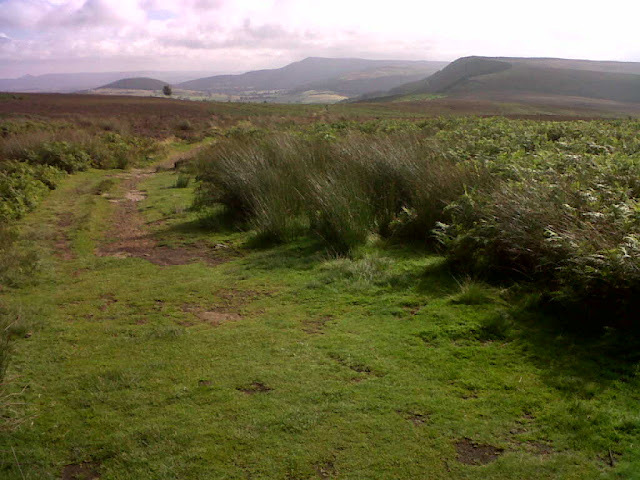 The day began by going up a steep track which took us to the top of the moor and onwards. This was just a taste of things to come as Stuart and I spent most of the day going steeply up hills and then down again! 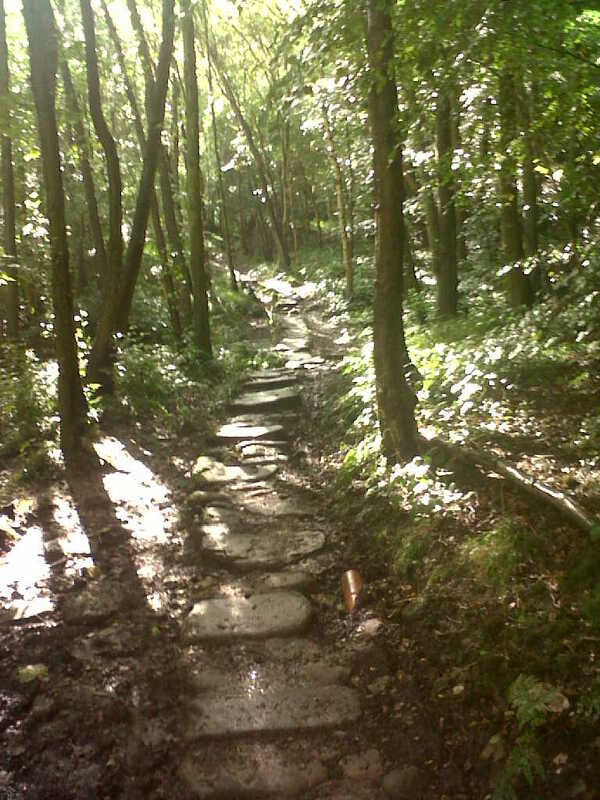 Steep up through Arncliffe Woods this morning. 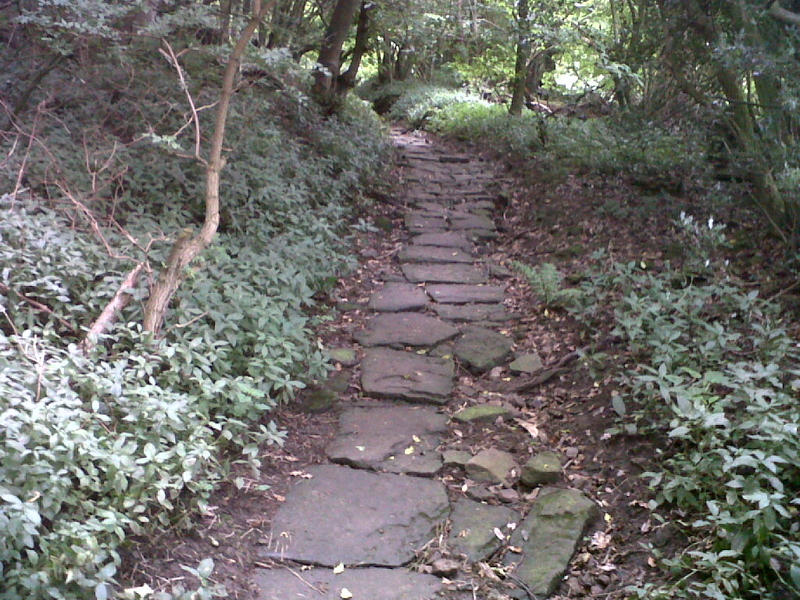 A stone in the path, purpose unknown. Just need to find stone B now! The weather today was windy and humid - rain was expected, but none came. Bonus! For most of the day our walk followed the Cleveland Way which was well signposted. Walking along well laid out and well signposted paths meant we were able to cover 12 miles fairly quickly. 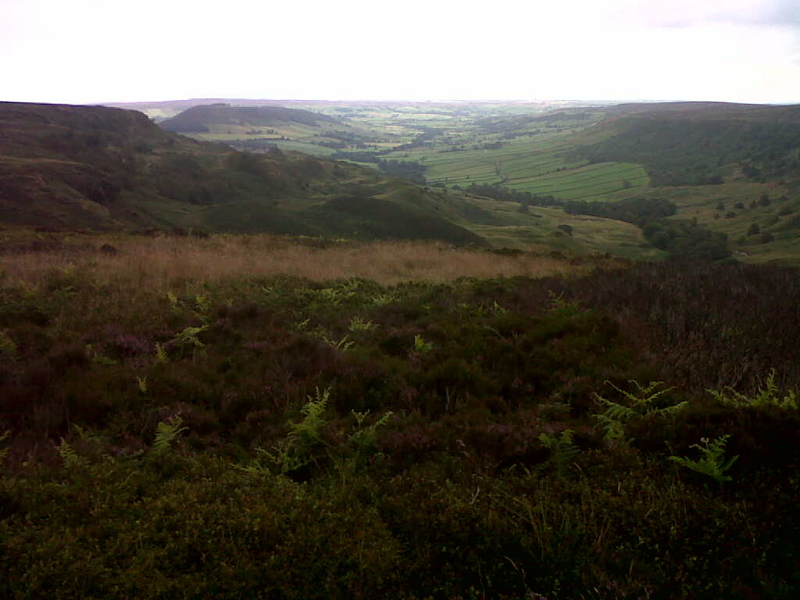 The North York Moors are the best walking I've experienced so far. Lovely views across the Cleveland hills of lovely countryside. Finished walking at 2pm, arriving at Clay Bank Top. Knees were hurting due to all the walking downhill today, but plenty of time to rest before tomorrow. Walked 12 miles, pleased with the progress today. Have decided to extend the walk tomorrow as the plan originally had been to do 9 miles but I reckon I can push on a bit more and then shorten the route on Saturday. Meanwhile Gary's Dad, Alan went to find a launderette today to attend to his duties. He asked a lady in Stokesley where the nearest one was. She asked him where he was from. "Nottingham" he replied. "Well" she said "Up here we have washing machines at home you know!!." Brilliant. Happy to report laundrette eventually located some miles away and all smalls washed! Ukulele song of the day "Day Tripper"
Nice early start today at 7.30am as there's a long day ahead to cover the 19.5 miles from Brompton-on-Swale to Ingleby Cross. 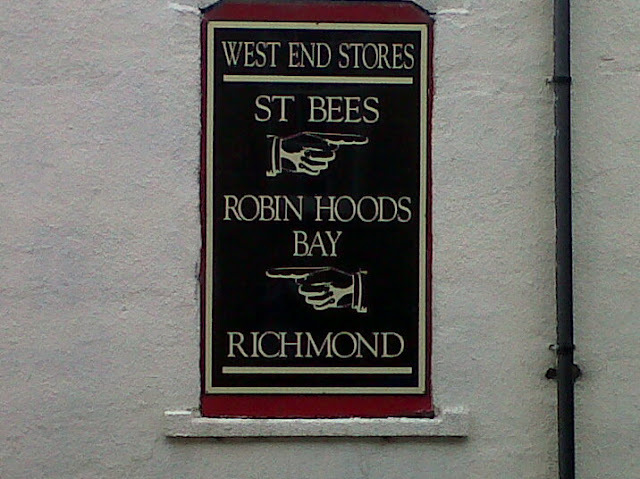 Still, it's all miles done taking me ever closer to Robin Hoods Day. It's hard to think about finishing. It still feels like a long way away. It's hard to think of more than one day at a time in terms of the walking. After eight and a half hours walking today my dogs are certainly barking!. Arrived in Ingleby cross at 4pm. I've been sleeping like a log, usually going to bed somewhere around 8.30pm and then getting up at 6am. I've a feeling that tonight will be no exception Not much else to tell. It was a long, flat day. Tomorrow will be shorter and hopefully more interesting. Your messages of support really help, especially on days like today. The phone signal is much better now, so I'm able to get messages via Facebook, text, e-mail and Twitter much more regularly. Don't always have time to respond but huge thanks to everyone. Ukulele tune of the day, "King of the Road"
Gary's walk was mentioned on Twitter today by The Miscarriage Association, who are obviously following his progress closely. Started walking the 16 mile route from Reeth to Bromptom-on-Swale today at 7.45am. The weather was cloudy at first but very hot, then later sunny and humid = sweaty walking. Much better signage in Yorkshire! Lots of good level walking today with some steep ups but not too bad. Climbed the Nun's Steps to Marrick village from old Marrick Priory. The 375 steps were built by the Nuns to 'join up' the village and Priory. Decided not to stop at Elaine's Country Kitchen for a brew as it was too early and I wanted to crack on! Much walking with clear paths across fields and farmland ensued with only one man vs cow incident. Man won by giving the beast a wide berth. Lots of actual Coast to Coast signs now. 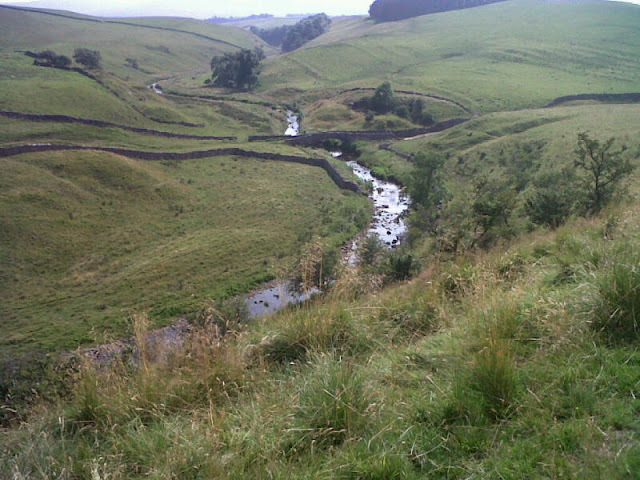 Continued to follow the course of the River Swale as it gets wider and wider each time I see it. Passed through historic Richmond and out into the Vale of Mowbray finally stopping at Brompton on Swale. Blister count today is 2. Alan got more supplies of Compeeds as I'm getting through them fast. They are a complete godsend and really work. Trying to look after my feet so they look after me! 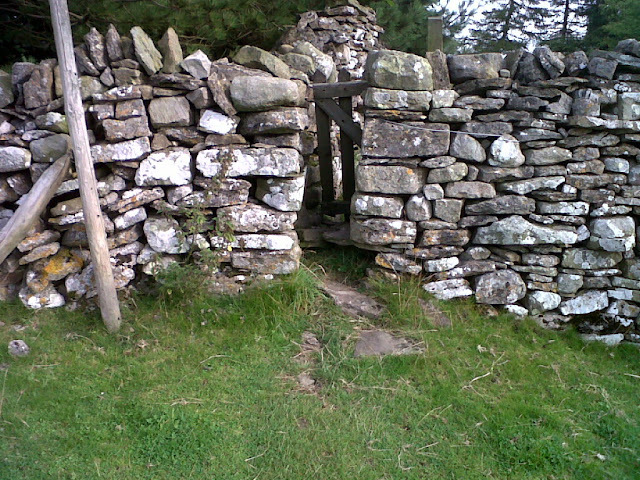 Narrow stiles, the gates are like Arkwright's till! Finished walking today at 2.45pm. Plenty of time for feet up & a good rest. Lovely. Tomorrow's a long one, 19 miles. Just in case you're not sure! 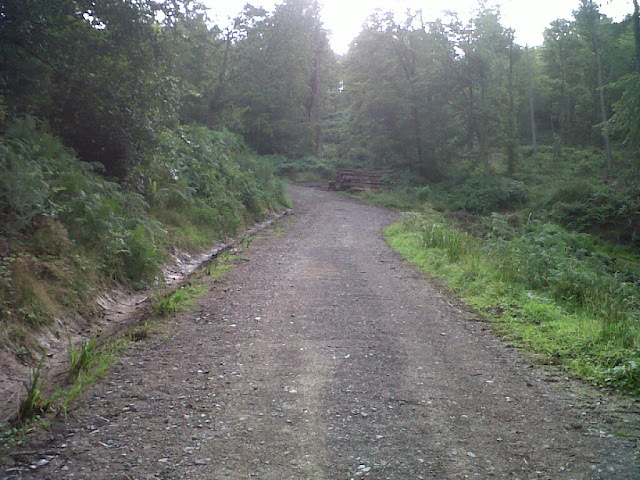 Day 8 - the start of the home straight!. After a night under canvas and his now customary bowl of porridge, Gary began walking slightly later this morning at 8.45am. 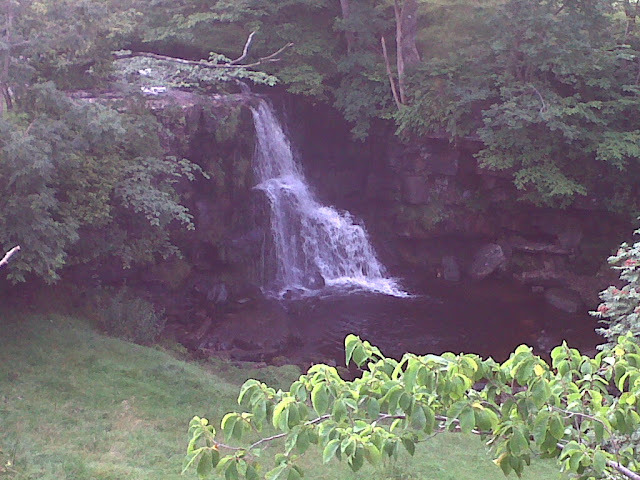 Day 8 saw Gary follow the River Swale on route to Reeth 12 miles away. Today was a shorter day which provided a choice of route, high or low. Gary took the low option and stuck to the valley. When the sun came out it was beautiful. 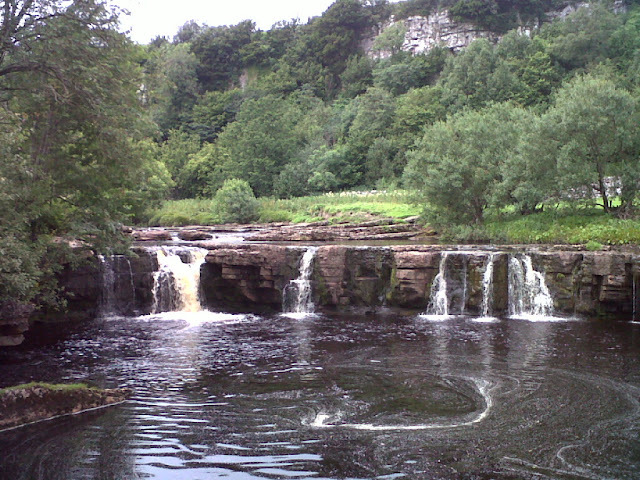 The River Swale that Gary's following has been getting wider all day. The paths were all good but the main difficulty today were the stiles which are very narrow gaps in the wall wide enough for a leg to squeeze through but not wide enough for a sheep to get thru. "A challenge for a man of my girth" said Gary. The Yorkshire Dales are lovely. And in Gary's opinion are nicer than The Lakes. 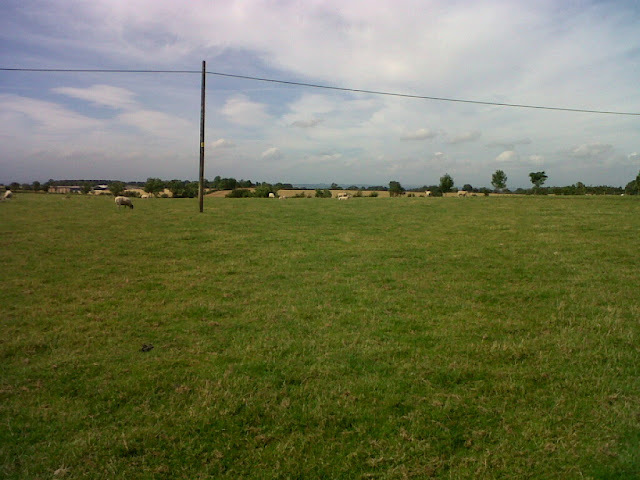 The landscape is more rolling and rural, less mountainous and wild. 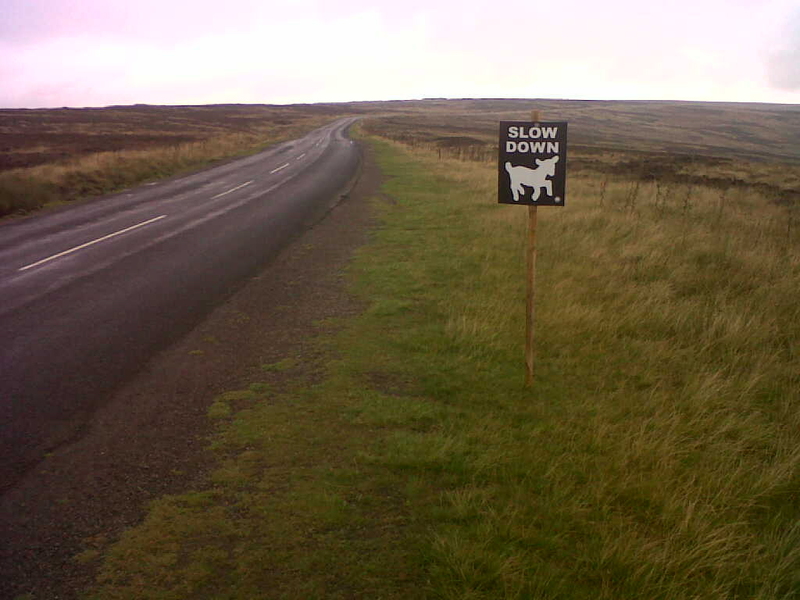 Proper James Herriot country! Gary made on brief stop today at Ghyll Foot tea room in Gunnerside, where they serve tea in pints. Yes, you read that correctly, pints! Gary decided he wasn't quite that thirsty. Last nights ukulele tune "Happiness Pie", in honour of the Steak & Ale pie Gary enjoyed at the pub last night! Special message from Lachlan to Daddy "Only 5 more sleeps Daddy. I love you x x x x x x"
Day 7, Half Way There! Gary left Kirby Stephen at 8am this morning up the steep road out of the town heading for the Nine Standards Rigg. The Nine standards are found 3 miles east of the town. They are found 662 meters or if you prefer, 2712 feet above sea level. 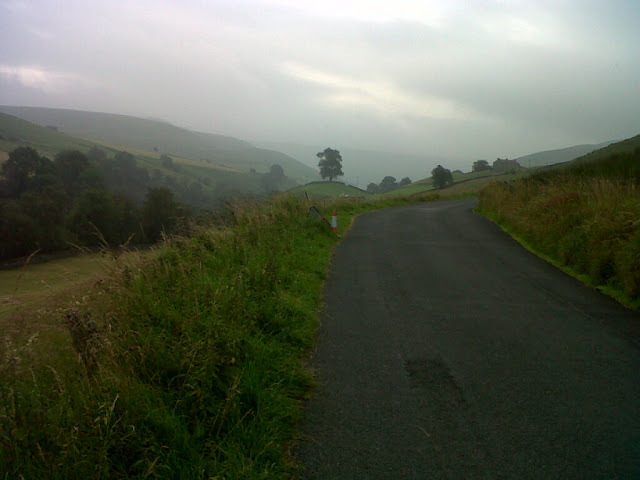 Gary was full of trepidation as when he set off there was lots of cloud and mist. He was mindful that the advice is that if you're not able to see the tops of the standards at a certain point in the path then you should not go up but take an alternate route round instead. By the time Gary had walked a couple of miles or so it had blown over so he headed on up. According to the Visit Cumbria website: " The origin of the nine "stone men" or columnar cairns on the summit, is a mystery, and some of the cairns, which are about 10 feet tall, are now in a perilous state. 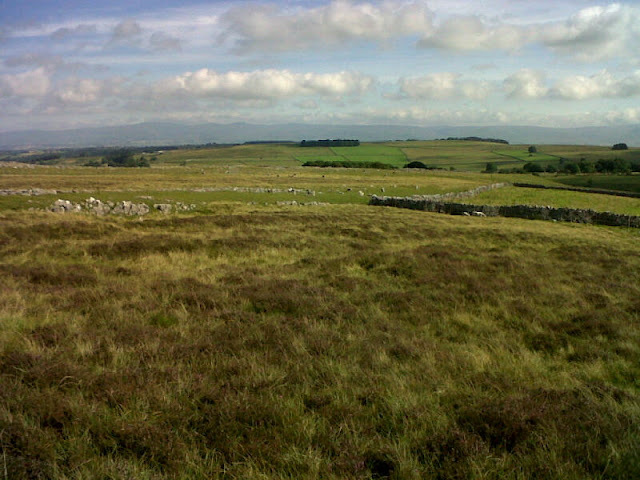 According to Wainwright, whose Coast to Coast route crosses the fell, they are very ancient and are marked on 18th century maps. One theory is that they were constructed by the Roman army to look like troops from a distance". You learn something new everyday! Today was incredibly windy blowing right into the face. Hard going. It began to ease a little on the downward track. 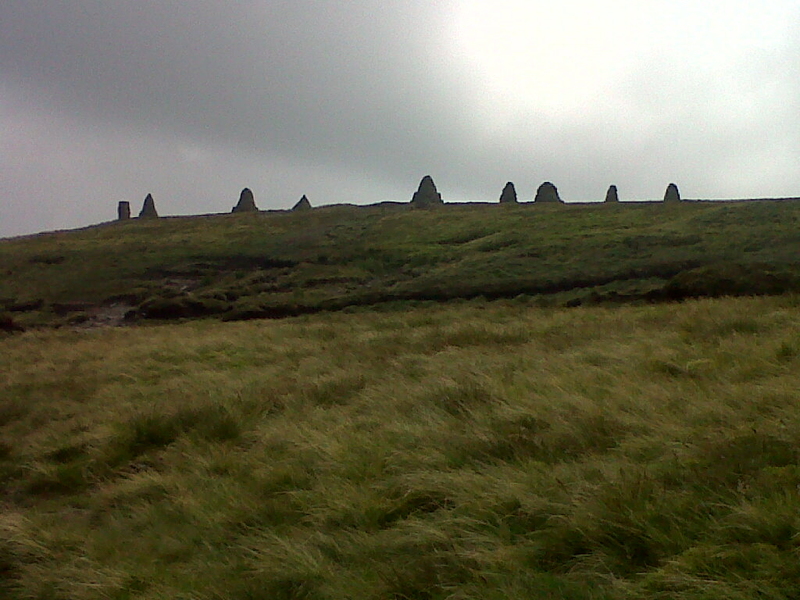 Six miles walking through peat bog followed. Happily for Gary he again happened upon fellow Coast to Coaster Stuart, (see previous blog entries). Although there hadn't been any rain here for over a week, Gary still found himself in it over his ankle at one point. He saw another walker who was well and truly in it up to his shins so Gary thought he'd got off likely. He and Stuart were again able to help each other out. Progress was slow. Stuart also stuck his hand in his pocket and gave Gary a donation for his charity. Huge thanks to Stuart for all his support, financial and otherwise. 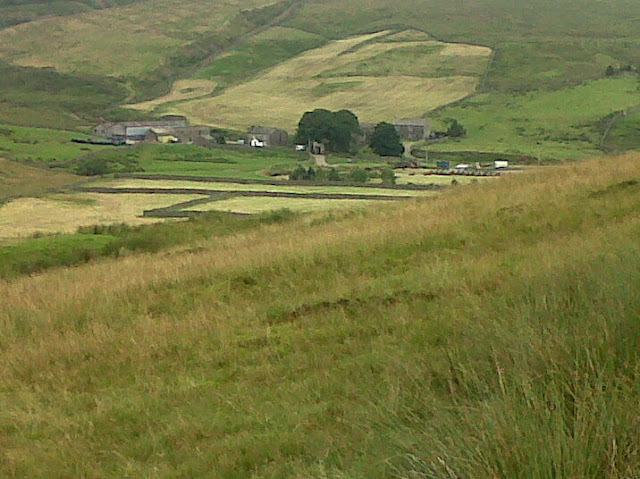 Eventually they spied the welcome sight of Ravenseat Farm. Ravenscar Farm, a very welcome site. The farm provides another traditional stopping point on the coast to coast route. The farmers wife serves refreshments and cake. Gary recommends her cream tea! Here Gary met his Dad, Alan who continues to provided support in all its many forms. 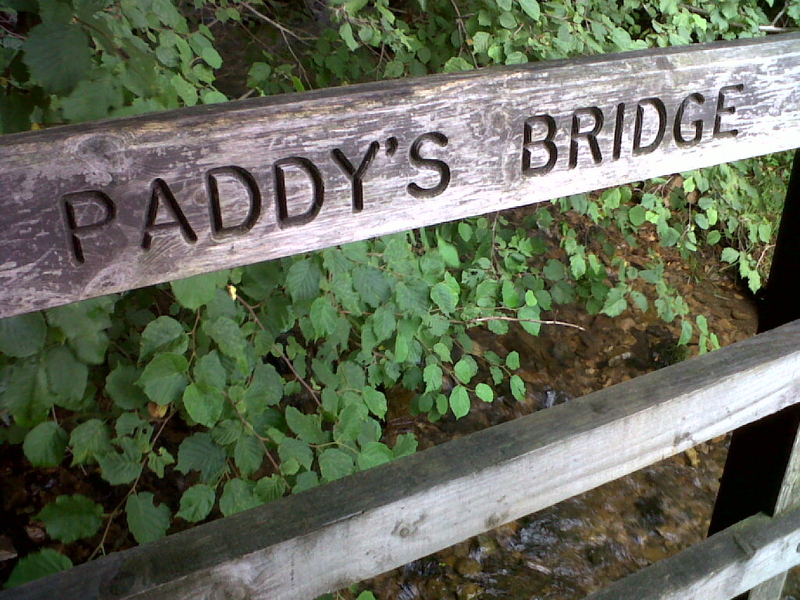 It was here that Gary heard a voice say "Are you the bloke that's doing this for charity?" Gary promptly received 2 more donations! One made by John from Surrey a walking guide who is currently talking a party of walkers Coast to Coast and the other from another John from Australia, who's one of the walkers with the party. Fantastic stuff!, many thanks to both Johns. 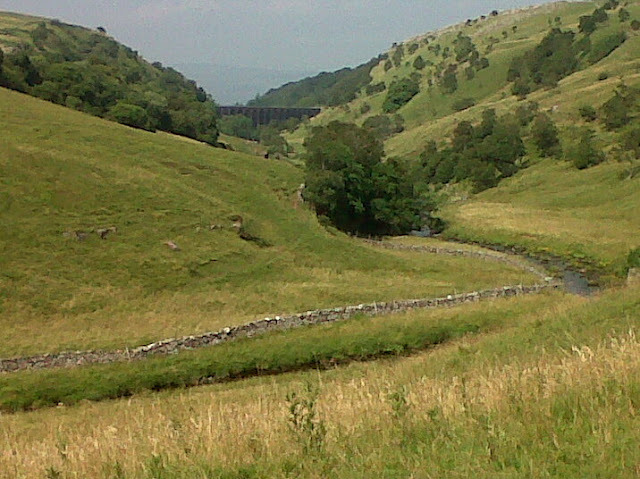 The walk only crosses 2 counties, Cumbria and North Yorkshire. 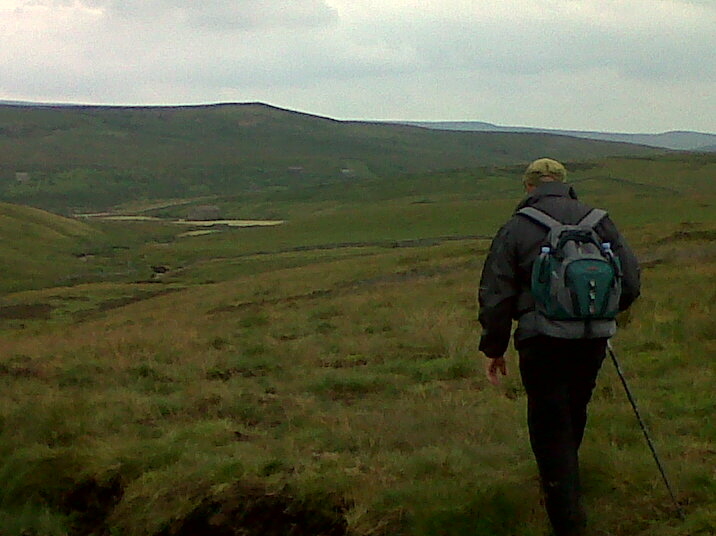 Today saw Gary cross the Pennines and on into North Yorkshire. A massive boost. 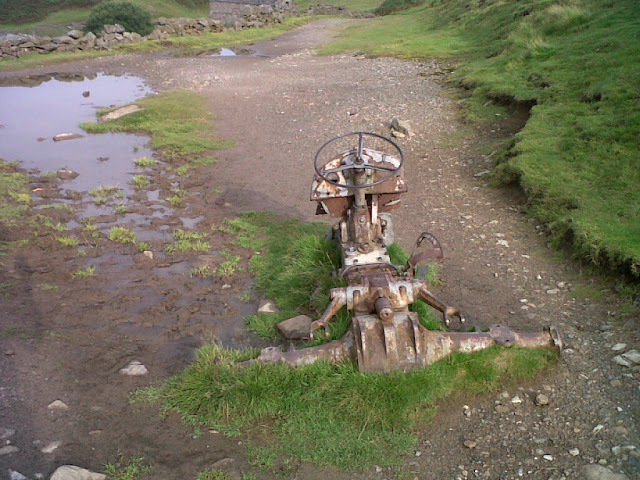 Up till now all the rivers Gary crossed had run west into the Irish sea. From now on all the rivers would run EAST to the North sea. I asked him how that felt, "Good it feel really good. I'm feeling really positive". 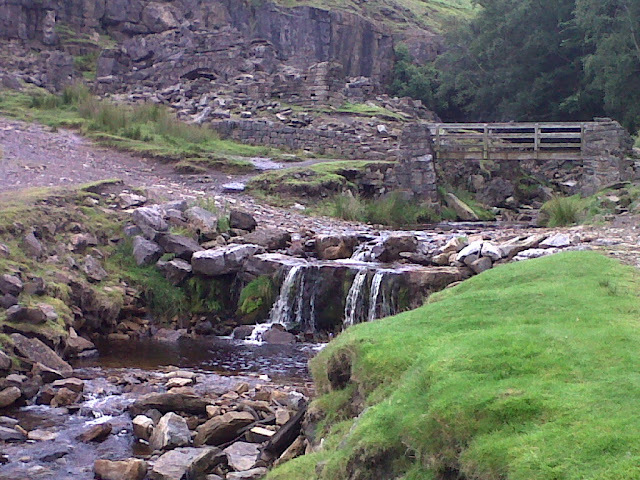 Gary made it into Keld at 3pm. After a shower, change of clothes and short rest, Gary and Alan headed off to find a phone signal. Gary celebrated making it half way at The Black Bull in Naseby, which is located in the "middle of nowhere". Time to enjoy a Steak & Ale pie washed down with a pint of Black Sheep, which was billed as "Great Yorkshire Beer". Gary concurs! ***TOTAL DONATIONS £1202! ***THANK YOU ALL***. If you haven't already donated, it's not to late. Just click the Green button to the right of the screen to take you straight to Gary's Just Giving Page. Gary started his sixth day at 08.15am with a spring in his step. Although he had 20 miles to cover today, (the furthest distance he will cover in a single day), he was expecting the going to be much easier than yesterday. 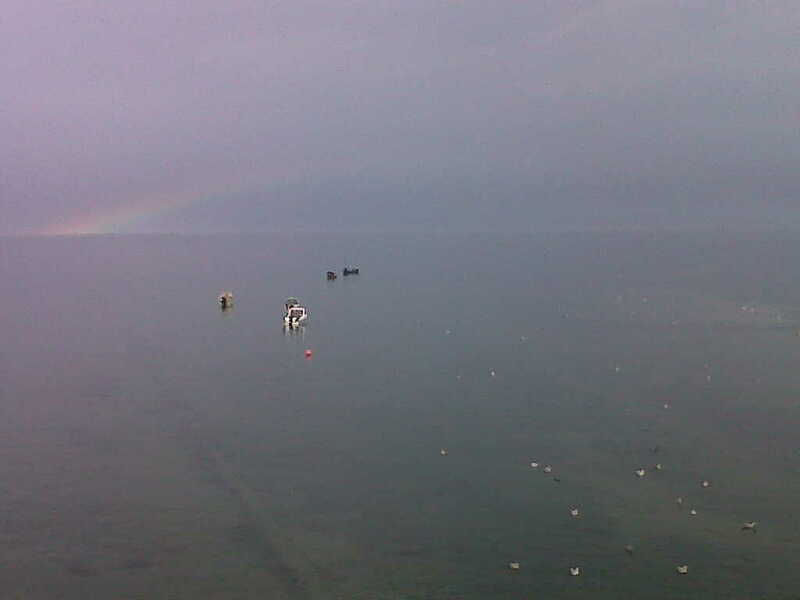 The conditions were also more favourable than yesterday. It was sunny but not as warm as yesterday. 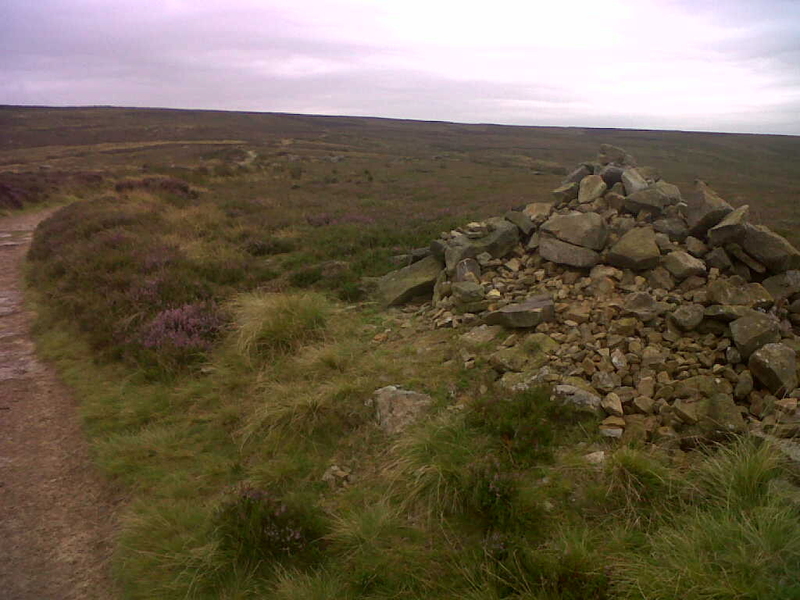 The route was fairly exposed over lots of moorland and open farm land. Thankfully there was a gentle freeze all day which was initially gratefully received by this walker! We've received lots of positive comments about the photos on the blog. All the photos have been taken by Gary on his camera phone, and he's taken some real crackers! Today saw Gary cross the M6 motorway, which according to Wikipedia is the "longest motorway in the United Kingdom and one of the busiest". It's also referred to as the Backbone of Britain due to it's central position, so it was a good psychological marker to get across. 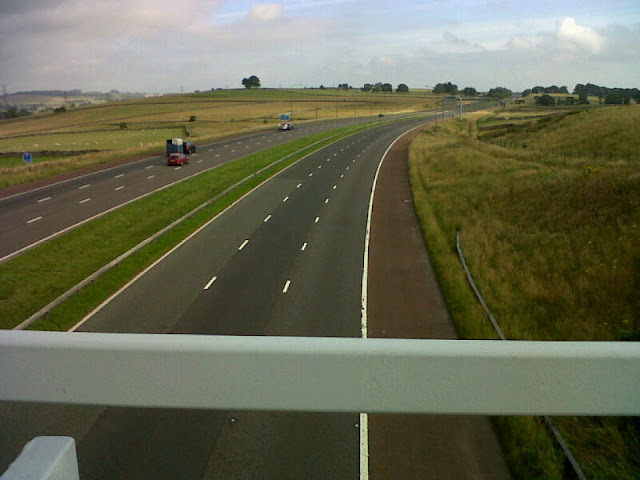 Taken from the footbridge across the M6 looking north. Never seen it so quiet! At some point today Gary passed Scar Side Farm which had a chalkboard sign outside the farm house stating, "Last stop for refreshments before Kirby Stephen". Gary stopped for a welcome break and had a glass of lemonade and a piece of homemade cappuccino cake, (farmers size portions!). Nice. Gary enjoyed his stop sitting in a marquee in the garden whilst the farmers kids played on a trampoline. 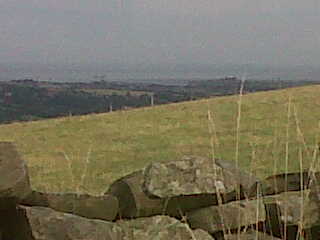 Looking east...the Pennines are getting closer. 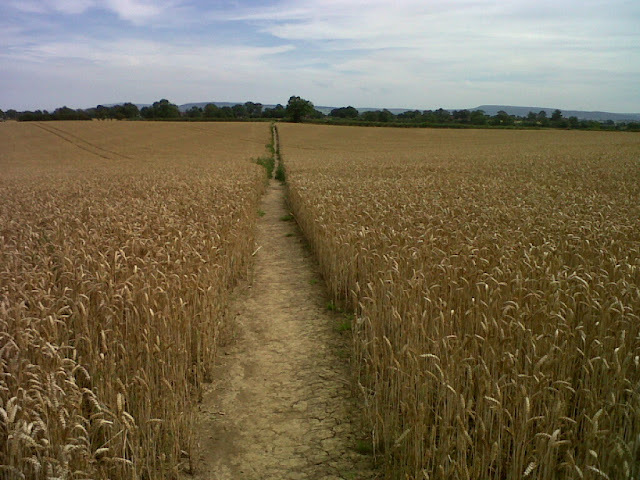 Wainwright states in his guide book that the benefit of walking Coast to Coast from west to east, (as Gary is), is that the prevailing wind is behind you all the way. It wasn't today! It was in Gary's face, (shall we just blame global warming?!). An unexpected obstacle today was a herd of cows heading for milking which greeted Gary about a mile out of Kirby Stephen. He gingerly picked his way through avoiding their rear ends at all costs! Gary likened it to a game of Frogger, it slowed his pace right down!! Having started the day all jolly, jolly thinking,"This is good fun", Gary literally hobbled into Kirby Stephen at 5.30pm. This evening consisted of feet up & rest up, ready for the 14 mile walk tomorrow will bring. Gary & his Dad are back under canvas tonight. Ukulele song for tonight "Everybody Hurts" by REM. 'Nuff said. Thanks for taking the time to check out my blog. Please have a good look around and leave me some comments. Don't forget to bookmark / favourite this page! So why am I raising money for the Miscarriage Association? Someone has to. They need a relatively small amount of money to keep going every year, and the work they do is really essential. In 2009 and 2010, Helen and I lost 2 babies in the space of 5 months. The loss we felt was immense and still is. 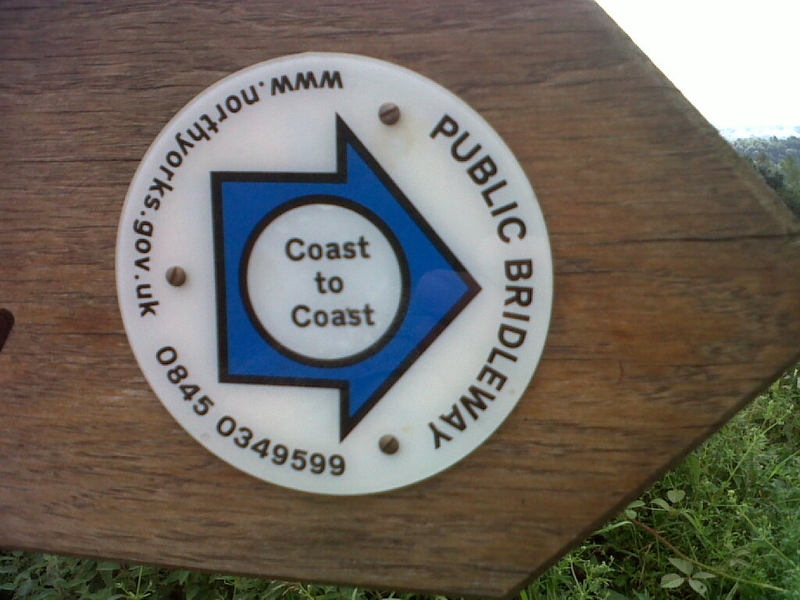 So, in 2012 I will be completing Wainwrights Coast to Coast walk, from St Bee's Head on the Cumbrian coast, to Robin Hoods Bay on the North East coast, a walk of approximately 200 miles. It should take about two weeks and I will be camping whenever possible to keep the costs down. every penny really does help. Send the website address to everyone you know - all I need is for 1000 people to give £1 each and I've made my target. So Who's the Fat Bloke? Hi. I am a 38 year old primary school teacher who lives in Cropston, just north west of Leicester with my wife, Helen and 5 year old son, Lachlan. I've been walking in Leicestershire, Yorkshire, the Lake District, Cornwall, Derbyshire and the Malvern Hills, and love being outdoors. I've been camping in most of these places and in Norfolk and Devon. I enjoy playing the Ukulele as often as I can, singing, darts, golf and growing my own veg. I'm looking forward to completing the walk, blisters and all, and being able to say that even while enjoying a great outdoor experience, I can raise money to help others who have been through the same experience as Helen and I. And yes - I will be taking my Ukulele with me and I'm hoping someone might sponsor me for a song played at each stop along the way! 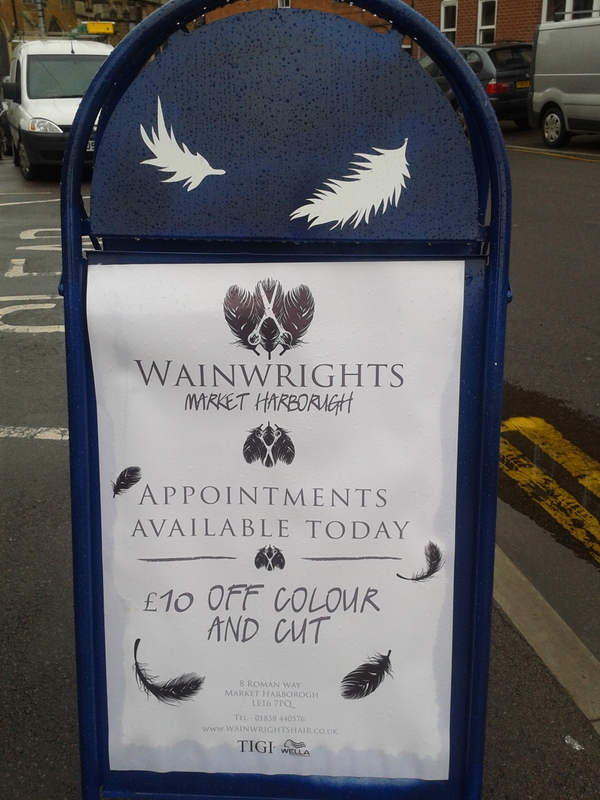 What is Wainwright's Coast to Coast? 'A Coast to Coast Walk was devised by Wainwright himself, and set out in his 1973 guidebook to the route. The route is a 192-mile (although according to a recent re-measuring the real distance is almost 220 miles) unofficial, long distance footpath in Northern England. 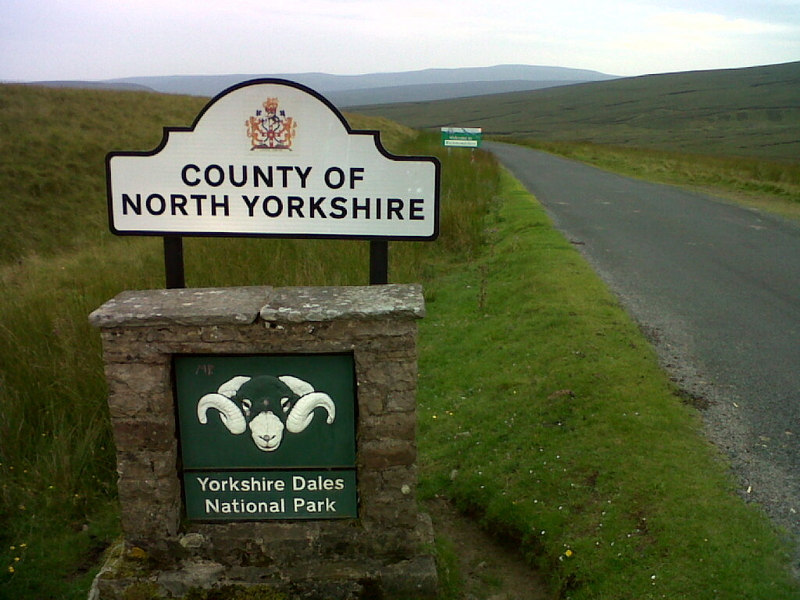 It passes through three contrasting national parks: the Lake District National Park, the Yorkshire Dales National Park, and the North York Moors National Park. 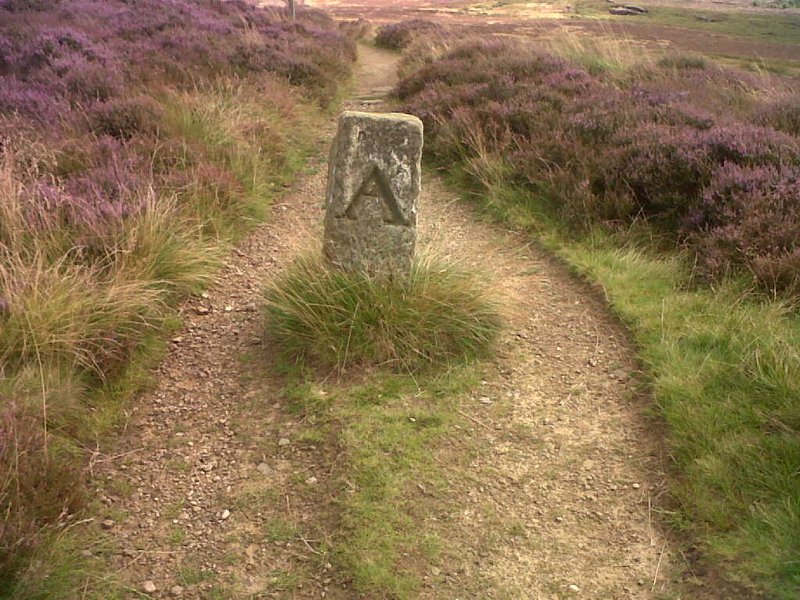 Wainwright suggested a way of breaking the walk miles into stages, each of which to be completed in a day. With one or two rest days, this makes the route fit into a two-week holiday. 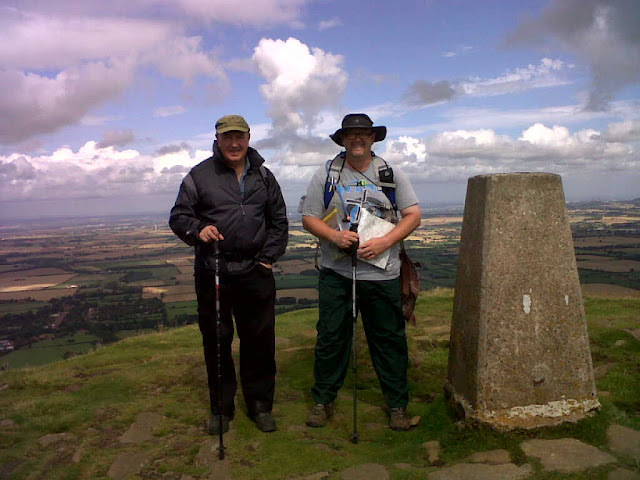 However, Wainwright explicitly stated that he did not intend people to necessarily stick to these stages or even to his route: for example, by reducing day-lengths to 10 or 12 miles, the walk becomes a much easier three-week trip with time to 'stand and stare'. I'll be breaking the walk into 14 stages, walking an average of 14 miles a day. However, this varies a lot - my shortest day is only 8 miles and my longest day will be 20 miles. Whichever way you cut it this walk is one of the best long distance walks in the world and I'm very lucky (as well as a bit bonkers?) to be attempting it this August. Let's hope I enjoy walking it as much as I've enjoyed organising it!